All set and looking forward to your May Day holiday? Not so fast, young pioneers! 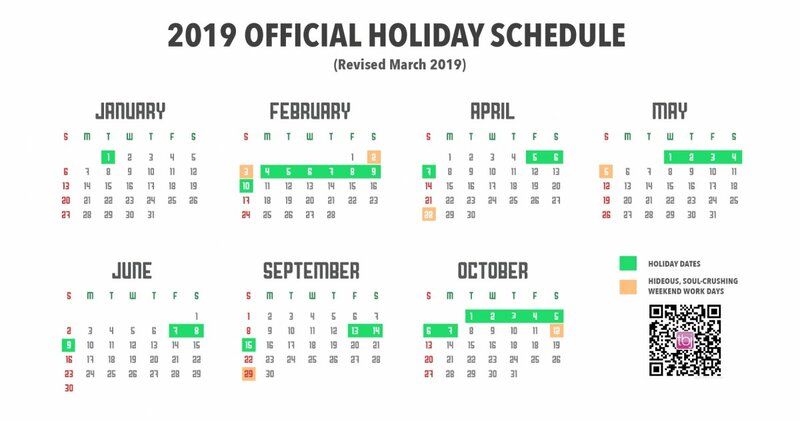 The government recently announced, via WeChat of course, that the original holiday dates of Apr 29-May 1 (with preceding make-up days on Saturday and Sunday, Apr 27-28) have now been changed to May 1-4, giving us an extra holiday day in the process. Previously, May Labor Day was preceded with a full seven days of work. Now it’s flanked by two six-day work weeks plus two awkward days of work in the lead-up. One bonus: if you haven’t already booked your time off, it could be a good bet to take Apr 29-30 off and lap up a six-day holiday. No official reason for the adjustment of the holiday has been given but one thing is for sure: it’s not a good look for the government to have made the switch a mere five weeks before the May break. Many people will have already booked tickets to travel during one of the year’s biggest holidays and likely means headaches for employees, employers, and train station attendants alike. Still, it would be rude of us to balk at extra government-mandated time off! Qing Ming Festival: The three-day Tomb Sweeping Fest kicks off on Friday, Apr 5 and finishes Sunday, April 7. No make-up days. May Labor Day: One make-up day on Sunday, Apr 28 and one on Sunday, May 5 now flank the four-day holiday of Wednesday, May 1 to Saturday, May 4. Dragon Boat Festival: This three-day festival is effectively reduced to one day off Friday, Jun 7 as the following two days fall on the weekend anyway. No make-up days. Mid-Autumn Festival: The same situation applies to the 2019 Mid-Autumn Festival: the three-day holiday begins on Friday, Sep 13 and ends Sunday, Sep 15. No make-up days. October National Day: The second Golden Week of 2019 runs from Tuesday, Oct 1 from Monday, Oct 7 for a total of seven days off. Two make-up days: Saturday, Sep 29 and Saturday, Oct 12.